Designing the I2C mux board was pretty straightforward. Doing a board like the SunAirPlus board was at least 10 times more difficult; it required more engineering and a much more expensive design process. Of course, having the completed product (Figure 17) is only one step in the process of making it a commercial success. Figure 17: The completed product. 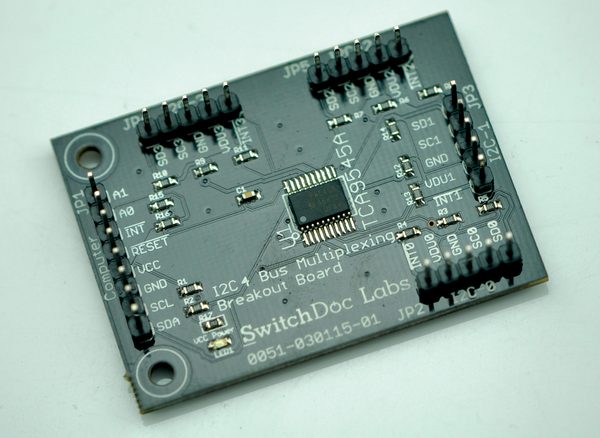 The I2C mux breakout board was one of three boards funded by a successful Kickstarter campaign in March 2015 . The idea behind using Kickstarter to fund these boards is twofold. First, a Kickstarter campaign can validate the idea in the market. Does anybody want this board? Are they interested enough to take the risk of donating? Second, you can use Kickstarter funds to cover the initial engineering costs for production. Because you're offering boards as rewards for support, this means you get pre-orders for your boards at low margin. This is a tradeoff: You want the campaign to be successful, but not so successful that you cannibalize future sales. Now, I am off to use the I2C mux breakout board to fix an I2C address conflict in the WeatherPi solar-powered weather station . It's good to have a new easy-to-use board!